Guess what? It's Nikki, filling in for Amber today. You don't know how much I've missed blogging on here. Today I'm going to talk about another type of writing that we don't mention on here often...memoirs. Writing a memoir can be as simple as keeping a journal, or writing experiences for future generations. This can be the most important and inspirational writing we can ever do. About ten years ago, my grandmother wrote down the experiences of what happened to her when she was left an orphan at the tender age of 12. The experiences she had were harrowing and would definitely make a great book! But for me it's about knowing the stuff my grandma is made of. We are writers yet many of us don't write the story that is most valuable to us, our own. Mostly because we have been told there's not much of a market for it. Especially in the LDS Publishing companies. But who cares! There are three things you can do with your memoir. Write it and keep it hidden where no one will find it until you are gone! Write it and publish it for your family either straight off the computer or on a website like Blurb.com. Or you can do the really brave thing and self-publish. Her man must give his only life. For Freedoms cause that he must die. For nothing in this world is free. Even though Joe sent this cadence to me, I never imagined that “[giving] his only life” would be our reality. He was a West Point graduate, a Gulf War veteran, a Captain in the Army and my husband. In this memoir, I relate my loss and how I found courage to keep moving on. In between the pages of grief and healing, I tell our story — how we met and fell in love and the challenges that came with Joe’s conversion to Mormonism and being a bi-racial couple in the late 1980’s. The silver lining for me in this tragedy was found in the precious box of letters and journal entries he left behind. As I raised our young children, I would read his hand-written words each night, and for a moment it felt like he was there, sitting right by my side, encouraging me and giving me advice. His example of integrity, patriotism, unwavering faith in God and love for his family has strengthened me, and left a legacy for his children. Now, as I share His Words, he can continue to inspire all who struggle through life’s hardships. 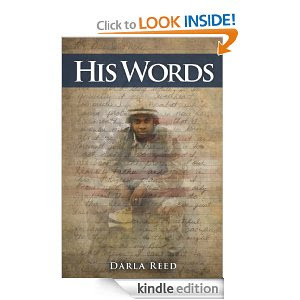 Darla immortalized her husband's words not only for their children and herself but for anyone else who would benefit from her experience. Then she has decided to share her proceeds with program that helps others. Her courage in making this step is inspiring to me. We, too, can make a difference with our words and the stories of our lives. Look deep within and ask yourself, "What is my story?" and then write it!